An ex-convict turned jewel thief attempts to build a normal family life and pull off "one last job." Starring James Caan as Frank, Tuesday Weld as Jessie, Willie Nelson as Okla, James Belushi as Barry, and Robert Prosky as Leo. Soundtrack by Tangerine Dream. 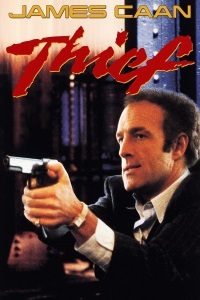 RottenTomatoes.com score 96%; #24 on Rotten Tomatoes' list of 78 "Best Heist Movies of All Time"
•et; "It is based on the 1975 novel The Home Invaders: Confessions of a Cat Burglar by 'Frank Hohimer' (the pen name of real-life jewel thief John Seybold." [...] As Hohimer, Seybold served as the technical advisor on the film's Chicago set, with FBI warrants outstanding." •et; "James Caan's emotional several-minute monologue with Weld in a coffee shop is often cited as the film's high point, and Caan has long considered the scene his favorite of his career." •et; "Thief marks the first film appearance of actors Dennis Farina, William Petersen, James Belushi and Robert Prosky. At the time a Chicago police officer, Farina appears as a henchman. Conversely, John Santucci, who plays the role of corrupt cop Urizzi, was a recently paroled thief and acted as a technical adviser on Thief. [...] Petersen, who later would star (along with Farina) in the Mann film Manhunter, appears briefly as a bouncer at a club." •et; "Near the end of the film, Frank destroys his house. The film company built a false front onto a real house and attempted to destroy it with explosives. The explosions severely damaged the real house, however, leading to its demolition." •et; "Thief's moody soundscapes were composed and performed by Tangerine Dream, providing the first of many notable film compositions they had in the 1980s. The film was nominated for a Razzie Award for Worst Musical Score." •et; Mann on the protagonist: "The idea of creating his character, was to have somebody who has been outside of society. An outsider who has been removed from the evolution of everything from technology to the music that people listen to, to how you talk to a girl, to what do you want with your life and how do you go about getting it. Everything that's normal development, that we experience, he was excluded from, by design." •et; Mann on the soundtrack: "My first instinct was Chicago Blues, however I felt that what the film was saying, thematically, and the facility with which the film might be able to have resonance with audience, I felt that to be so regionally specific in the music choice would make Frank’s experience specific only to Frank… So I wanted the kind of transparency, if you like, the formality of electronic music, and hence Tangerine Dream." Thief soundtrack (YT). Discussion of the deluxe release of the soundtrack. First time for Farina and Petersen, Belushi and Prosky! And Caan is letter perfect. Great cameo from Willie Nelson. I loved the scene where the lawyer bribes the judge using finger signs.